Original pink leather over wooden boards. Sir Thomas Phillipps (ms. 7008); Katherine Fenwick; Thomas FitzRoy Fenwick; Alan George Fenwick; William H. Robinson Ltd., London; their sale, London, Sotheby's, July 17, 1950, lot 27; purchased for Curt F. Bühler at Sotheby's (London, Feb. 28, 1955, lot 169) by E.P. Goldschmidt, London. Ms. written and decorated in East Anglia, England, early 15th century. 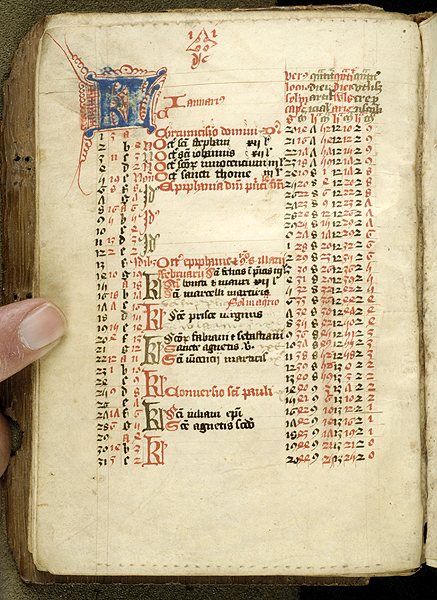 Texts: calendar for Norwich, in Latin (fol. 1v-13); tables for finding Easter, lunar eclipses, etc., for the years 1429-1479, in English (fol. 13v-14); "Ffor the tothe ache" and on urines, in English (fol. 15, 16-16v); Compotus manualis (fol. 17-25v); Metrical herbal, in English (fol. 26v-45v); medical recipes in English couplets (fol. 45v-49v); prose tract on the uses of rosemary, in English (fol. 50-52v). Decoration: 1 emblematic frontispiece, numerous filigree initials.